Your weekly round-up of local news for 28 January – 3 February. Police continued with their emforcement operation against rat-running in Elms Drive, Marston. Plans for the latest addition to Oxford University’s Old Road Campus will be on show on Friday 8 and Saturday 9 February. This is the new Institute for Developmental and Regenerative Medicine which will employ over 200 researchers. The exhibition is in Boundary Brook House on Churchill Drive, 4 – 7pm on Friday and 10 – 1 on Saturday. Police are appealing for information about another back-door break-in, this time in Kiln Lane, Risinghurst. St Lukes on Latimer Road has advised that their car park will be closed for six weeks from Monday (4th Feb) due to the construction of underground tanks. There will also be higher noise levels at times from the construction work. Headington seems to have an outbreak of door-to-door fish salesmen; whether it’s one group or several isn’t clear. While they may or may not be legitimate there’s always a worry about where the fish comes from, whether it’s been legally caught, and what recourse a buyer would have if it was sub-standard. Caveat emptor. Thanks to @ox_tale, @Howard_S, @JPDoy and @RobonaBike for information. The long-running refurbishment of the Barton Community Centre drags on, with local residents reported to be unhappy about work on the site being left in an unsafe state. Despite the challenge of snow and ice, outpatient appointments are going ahead today. Once again there were no new posts on the Headington & Marston e-democracy forum this week. Your weekly round-up of local news for 10 – 16 December. You know Christmas is just around the corner when @TheMasonsArmsHQ announces the Boxing Day Morris Mummers Play arrangements. Pizzas, burgers, quizzes and live music are all planned for the Somerset pub in Marston if the people behind The Rusty Bicycle and Rickety Press complete their take-over deal. We must wait and see if they keep to their theme and rename it The Ramshackle Somerset. Police have been issuing warnings to motorists using Elms Drive, Marston as a rat-run to avoid the Headley Way roadworks. £50 fines are threatened. Following a public exhibition last Monday the city council has opened a consultation about the redevelopment of Underhill Circus in Barton. The consultation is via an online questionnaire. You have to register, or login if you’ve registered for consultations before. Plowman’s Tower in Northway now has security guards to counter hooliganism and anti-social behaviour that has been ‘making residents’ lives hell’. CCTV is also being installed here and at Forester’s Tower in Wood Farm. There were no new posts on the Headington & Marston e-democracy forum this week. Your weekly round-up of local news for 3 – 9 December. Fire crews attended a tumble dryer fire in Foxwell Drive, Northway on Tuesday. Cllr Nigel Chapman (Headington Hill & Northway) planted a giant sequoia in Headington Hill Park on Wednesday. It’s this year’s planting by the Friends of Headington Hill Park. Cllr @MarkLygo (Churchill) has described the gym at Barton Leisure Centre as ‘a dump’. 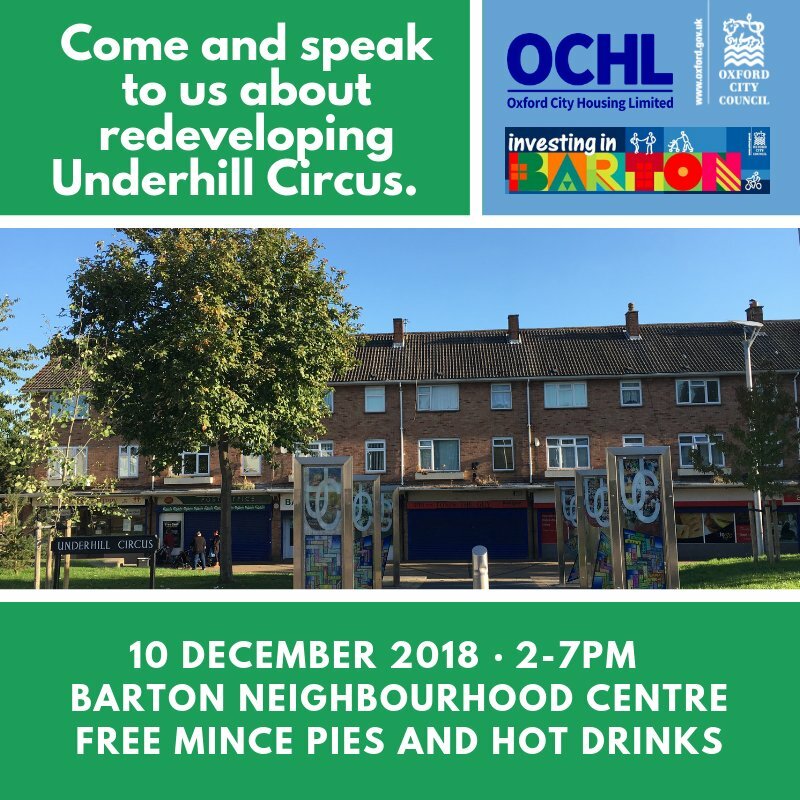 Also in Barton, the city council is holding a consultation exhibition today (10 December) about the redevelopment of Underhill Circus. It’s from 2 – 7 pm and they promise mince pies and hot drinks! I extracted all the policies in the City’s latest Local Plan document which relate to possible development sites within OX3. You can read about it and download the extracted document here. Slightly further afield, South Oxfordshire District Council has put the green belt land between Barton Park and the Elsfield road back into its draft local plan. @headingtonnews has compiled a helpful history of the redevelopment plans for this land. @TheAmpleforth‘s success in making it through its first year earned the community pub in Risinghurst a page in the Oxford Mail. The Bayswater and Boundary Brooks and other streams in the city have become dumping grounds for broken, stolen or just plain abused dockless bikes. Dear @OxfordCity Coucil. There is a dead deer blocking the downhill cycle lane on Headington Hill. It would be great if you could get it removed.